As exhibitors struggle to remain relevant in the age of direct download and day-and-date releases, many have realized they need to present something that can't be recreated in the home theater experience. It's why franchise movies have become such a thing, and this weekend shows another way studios are looking to get people motivated to leave their house – pure spectacle. Gravity is Mexican director Alfonso Cuaron's first feature film in almost seven years, and like that film (Children of Men), technical virtuosity is at the forefront in the promotion of the film. 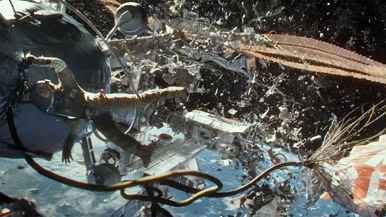 Sandra Bullock plays an astronaut/medical tech caught in a storm of orbiting debris that sends her spinning off potentially into deep space. Also adrift with her is another astronaut played by George Clooney, and the two have to work together in the most hostile and difficult environment possible to survive. Early word on the film has been ecstatic, with none other than James Cameron calling it the best space film ever made, and while that's probably overselling a bit, it's not some random schlub who wouldn't know any better. Filmed in 3D and optimized for IMAX screens, it seems to be one of the films for which 3D was intended in the first place, and would just not have the same impact any other way. At least, that's what movie exhibitors are counting on. Early promotion for the film took the unusual form of releasing full length scenes from the film, including most of the central incident that sets the film in motion. The idea seems to be “if this is how awesome it looks on a 17” computer screen, imagine how great it'll be in 3D and five stories high!”. It's the epitome of selling from a place of confidence. While reviews and studio confidence could not be more positive about the film, it does seem to be self limiting in one fashion – it might just be a little too intense for people to put up with. In some ways it's essentially a horror movie, just with an invisible villain and with a more practical solution to defeating it. So we have, in various degrees, amazing FX, a couple of A-list actors, a proven director and thrills – but just maybe too many for it to really blow up big. But blowing up medium? That sure seems very likely. Analogs for this are difficult to come by – you almost want to compare it to Tron and Avatar, but neither of those seems really applicable. The disaster movie craze of the early to mid '00s seems somewhat relevant but the scale of this is so intimate and personal that none of those seem to work as well. Ultimately, I think the gimmicky nature of the film is going to attract a large number of curious viewers and should bring the film to around $43 million this weekend.